No fillet knife in the bug-out-bag?? I (attempted) to clean fish once with a 'buck' style blade. Wasn't pretty. A fillet knife would be nice to have, and is something that would be standard equipment on any of my boats if I were bugging out on the water and expected to fish a lot. 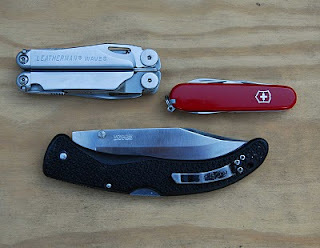 But these three are "knives for everyday carry" and so are not as specialized as a dedicated fillet knife. In a backpacking bug-out situation in the woods, I would keep the number of different knives to a minimum and simply gut and scale any fish I caught and cook them whole, "native style" in the coals. It's simple and avoids waste. Have you checked out the new Cold Steel XL Voyager folder lately? The one shown above has been discontinuted - the replacement has been receiving rave reviews! Check it out and see if you agree. You're absolutely right. Thanks for reminding me about the newer version of the Voyager. I'll post an update about it and links to where it can be found.